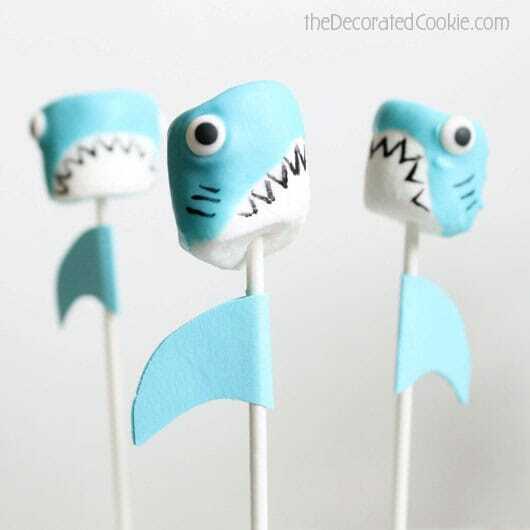 Shark marshmallow pops for shark week, a fun summer food idea. 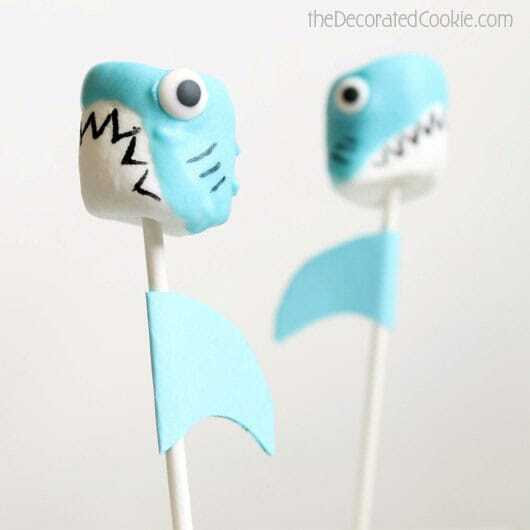 I live down the street from Discover Channel headquarters, so I had to make shark marshmallow pops for Shark Week. 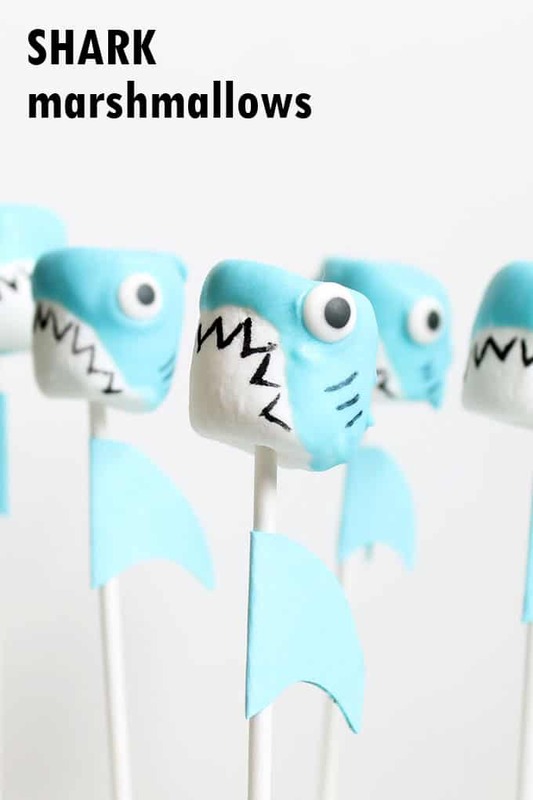 There’s a “why” behind these shark marshmallow pops. As many, many, many of you already know, SHARK WEEK kicks off today! The Discovery Channel headquarters is in Silver Spring, MD. And I live in Washington DC about a mile from Silver Spring and said Discovery Channel HQ. Every year I wonder, will Chompie return? I remember well a couple years ago when the giant, inflatable shark transformed the building for Shark Week. Click HERE to see awesome photos of Chompie from 2010. An inside source told me this year I won’t see the shark’s shadow as I drive up Georgia Avenue… but hopefully for the next big anniversary. 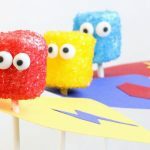 And apparently, the day I wrote this post there was a big to-do that included popcorn and toy sharks and other fun things at the HQ for passers-by to kick off Shark Week. Shucks to have missed that. 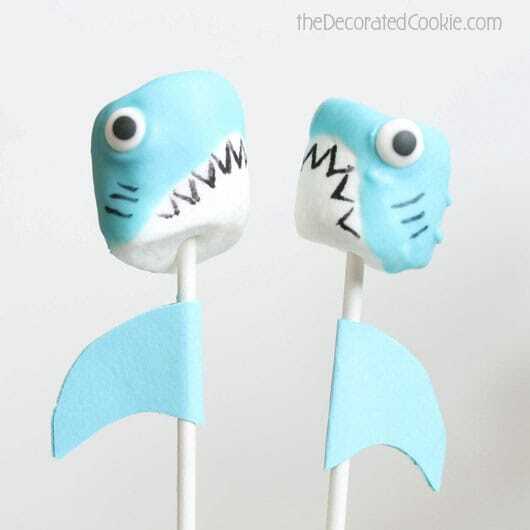 Bet they didn’t have shark marshmallow pops though. If you like these, check out these flamingo marshmallows. 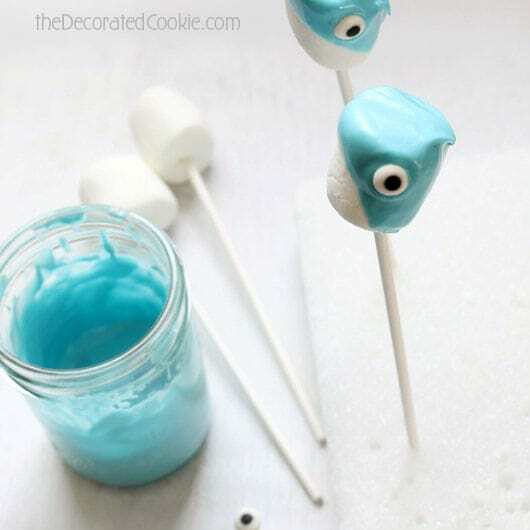 Or use candy melts to make sea animals. 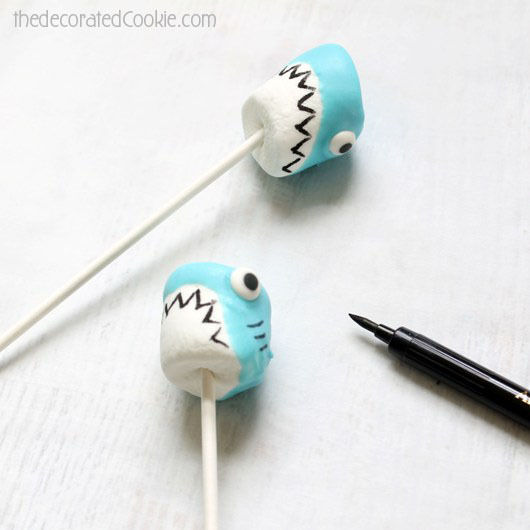 These sharks are relatively simple and easy to make with only a few supplies. They aren’t too scary looking, though, huh? You could always get a red food coloring pen and add some blood in the teeth. Or a foot. But I’m sticking with the Jabberjaw cute thing. Oh dear. If you weren’t born in 1972, you might not know who Jabberjaw is. And another oh dear. You might not even know what Saturday Morning Cartoons were. 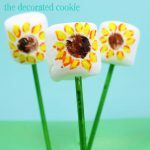 *Find the lollipop sticks, candy melts, candy eyes and Styrofoam block at the craft store. You may also find a black edible writer (or, food coloring pen) at the craft store. Though I prefer the Americolor Gourmet Writer. For tips on buying edible writers, click HERE. Microwave for 90 seconds at 70 percent power. Stir and continue to microwave at 15 second intervals until fully melted. 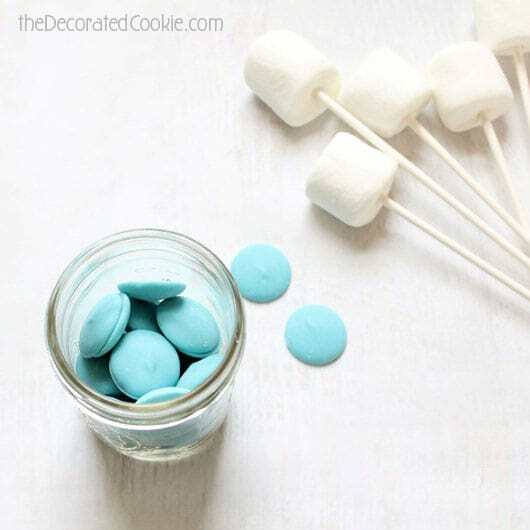 Dip a marshmallow in the candy melts, but leave the space shown at the front and bottom of the marshmallow un-dipped. 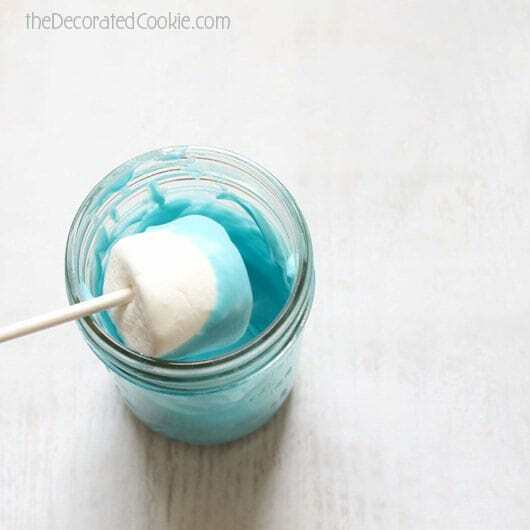 Gently tap the stick on the jar to shake off excess melts. Prop the marshmallow in the Styrofoam block. 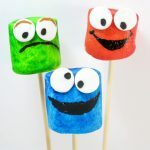 Attach two candy eyes at either side of the marshmallow pops. 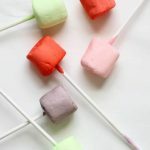 Repeat with the rest of your marshmallows and let the pops dry well, at least 30 minutes. Use the edible writer to draw teeth on the marshmallow and gill slits on the candy melts. Note edible writers often don’t write well on candy melts. It’s best to make quick, short lines using the tip of the marker. 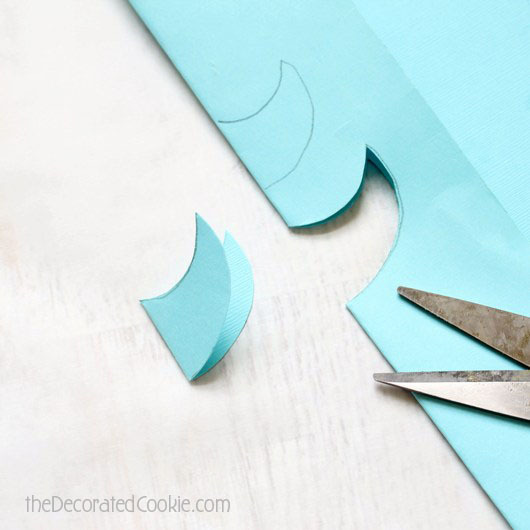 For the fin, fold a piece of blue paper. Sketch a fin shape along the fold. Cut out and glue the fin around the stick. Uh oh, it’s a shark face-off. My money is on the one on the left. The one on the right just looks nervous. 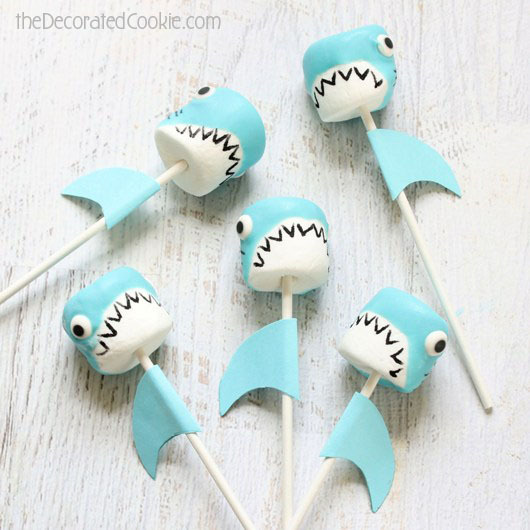 What a great treat for shark week. I spent many Saturday mornings watching Jabberjaw cartoons too. Don’t you miss those days? Yep! I also loved the Dungeons and Dragons cartoon… And about a jillion others! Oh my goodness those are sooo cute! Oh Meaghan! These are so cute! Adding the fin to the stick made them perfect! Pinning now! You’re so creative! These are adorable! These are so adorable! I love them it’s like too good to eat, lol! So creative! I absolutely LOVE these sharks! Who knew sharks could be so adorable! These sharks are adorable! 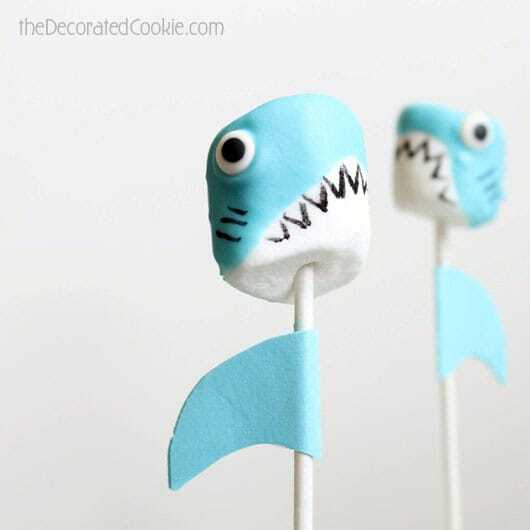 Just want to know how many shark pops the above recipe yields. We’re making an “Under the sea” event for 100-150 people, and need at least that many. Thanks. Hi Chanie, Great question! I put about 3/4 cup of candy melts in an 8-ounce mason jar to melt and that yielded about 10 to 15 pops. There are about 2 cups of candy melts per bag, so that’s about 45 to 50 marshmallows/pops per bag of candy melts. I’d probably buy 4 bags to be on the safe side :). These are sooo stinkin’ cute, nervous or not 🙂 Thank you for the inspiration! I absolutely Love them!! Our team mascot is Sharks! 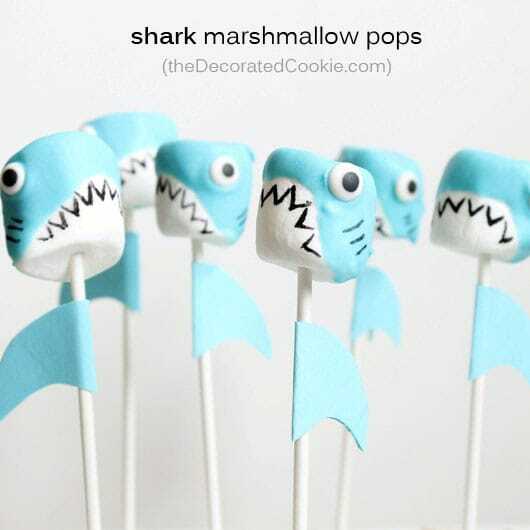 As a Sharkey parent I’ll have to try and make them. Definitely Leslie! These were a hit, hope you get a chance to make them!